You heard that right! I used a banana peel to shine my shoes. My boots were looking pretty bad, having made a few trips to the hen house surrounded by mud. They’ve also been scraped and battered over the years, and I never seem to have the time to shine ’em up. We don’t have any shoe polish here in the house and I didn’t want to go out and buy some, knowing it’s likely not made with the most environmentally-friendly ingredients. I had also done some research a year or so ago about 20 incredibly versatile things a banana peel can be used for. Shining your shoes with a peel was on the list. I figured it was time to give it a try. These seriously needed some help. The Method: Rub the inside of the banana peel all over your shoes. Spread that shiny gook all over and rub some of it in as you swipe peel over leather. Then, grab your soft cloth and buff, just as you would if you were polishing your shoes with that black or brown stuff you see at the airport shoeshine spot. Rub and then buff. Apply a second coat of banana peel goodness and rub and buff again. Do it a third time, and you’re done! They’re not sticky at all. The oil from the inside peel of the banana did its magic and my boots are good to go for a few hundred more miles. Maybe not perfect, but so much better! Try it, this banana stuff works. Buying taco seasoning is pricey and when you have the ingredients in your own home, why not just make a batch that’ll last you days. Your own seasoning is also lower in salt content. Here’s our family recipe that we’ve used for the past year, and sometimes the amounts of each ingredient change a little, based on just how much we have in the spice rack. We buy our spices in bulk, too, to save money, have a zero waste kitchen, and so we don’t accumulate a lot of those little plastic bottles. 2 teaspoons oregano (we like Mexican oregano) Enjoy! We stopped buying paper towels years ago. Never really needed them. And since we were eating mostly vegetarian meals, we rarely had the dilemma of what to do with a greasy cast iron skillet. Now that we eat bacon occasionally, because we’ve reintroduced a little locally-produced organic meat now and then, we have to contend with the leftover grease. We’ve used a few rags on the grease and just wash the rags, but that isn’t the best use for the rag. And then, one day a week or so ago, I posted a dozen lunch-bag size bags to give away in my local Buy Nothing group. (I save these little bags whenever they somehow make their way into our house, and the kids use them when they go on school field trips.) A member immediately posted a comment explaining that he uses those thin lunch bags to sop up his bacon grease. It was an “aha” moment for me. I decided to keep the bags, and now I have a small stash of little brown bags I can use to clean out my cast iron skillet when it gets a little too greasy. The thin bag is pretty darn absorbent. I throw in a little Celtic sea salt to scrub the bottom of the pan with the crumpled up bag, and the salt acts as a perfect scrubbing agent. No need to run soap and water over the well-seasoned skillet. And the pan is ready for its next job. The greasy bag goes into our next fire as fire-starter or we just toss it in our compost. Save those little bags for jobs like this! Giving used clothing away to the poor here in North America is often a strangely disconnected experience. I’ve donated clothes for years to local charities, but it’s always, sadly, an anonymous gift. There’s so much joy in connecting directly with the people who need your clothing! Putting a human face on poverty and need should not be shameful. What’s troubling to me is that most charities in the US act as a buffer between you, your stuff, and the people who could use your stuff. If we could connect with those in need more easily, I believe we’d all give more freely. The more we can put a face on those who are in need, the less taboo the subjects of homelessness and poverty will become. 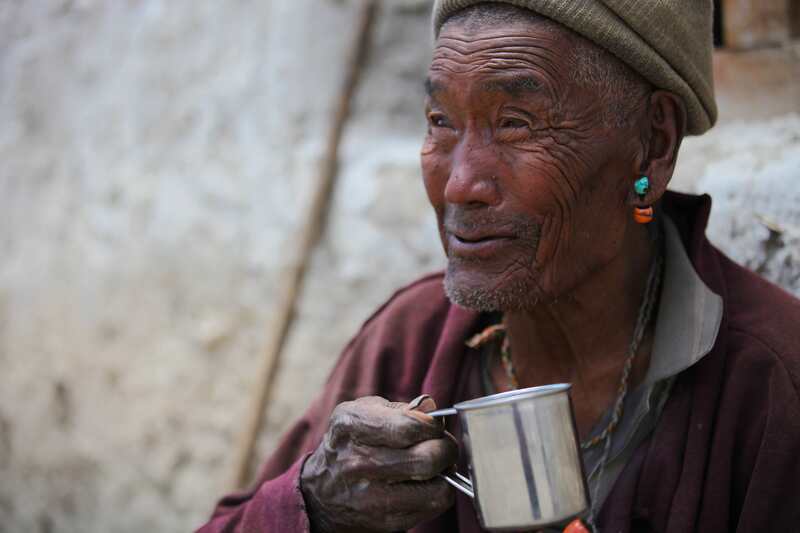 A recent trip to Nepal compounded these revelations for me. “Divide the clothing into 17 piles.” We had brought 4 duffel bags filled with socks, jackets, pants, hats, all the clothing necessary to keep a family warm. What we didn’t anticipate was that the clothing would have to be divided into 17 equal shares. This village has 17 households. To keep it fair amongst all families in the village, the decision was made that no matter whether a family had children or not, all the clothing would be divided evenly and the families could then trade amongst themselves for clothing based on need. 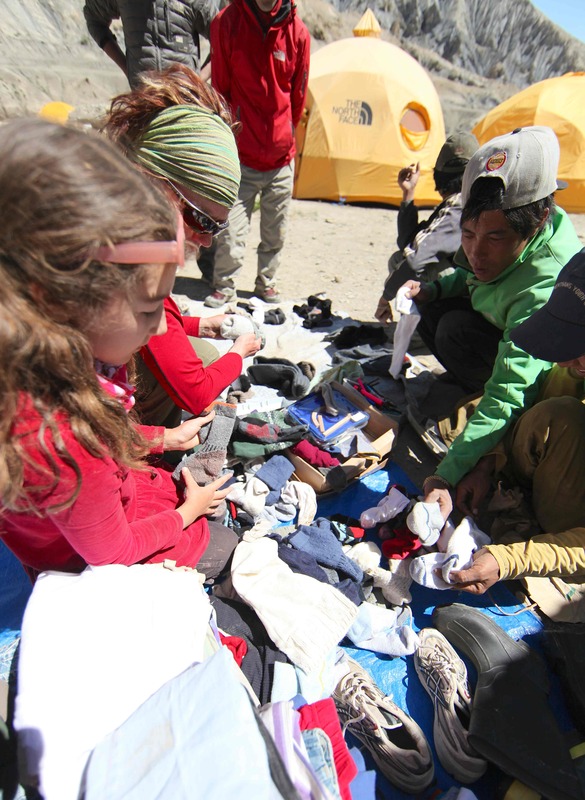 We put 17 pairs of pants, shoes, socks, shirts, jackets and hats, even stuffed animals into discreet piles. A lottery was then devised where a name was pulled out of a hat and that family could pick up a pile of clothing. I saw no bartering or trading after each family received its pile, everyone received their share happily and a little shyly. What amazes me is that the clothing from my family and my daughter’s best friend’s family, plus some shoes from The North Face and socks donated from a shoe store could clothe an entire village, or keep them happy for a few months with some new things to keep family members warm. A few distributed toys, too, brought joy to all ages. If you have worn clothing, please don’t throw it away. 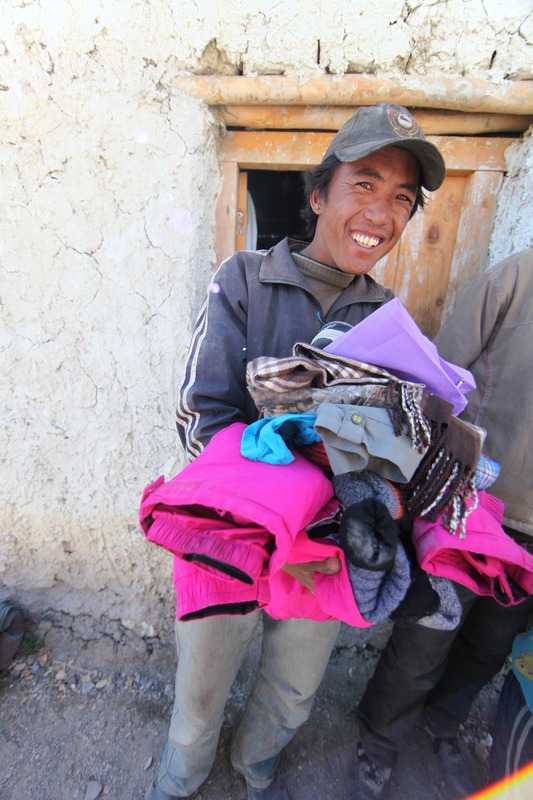 Your clothes could make a mother or child happy, help keep them warm or even provide material for new clothing that they’ll make from your old ones. I’ve seen my old pants cut up and used as patch material for a child’s pants here in Nepal, or a T-shirt worn by a lama as an under-layer of clothing for months. 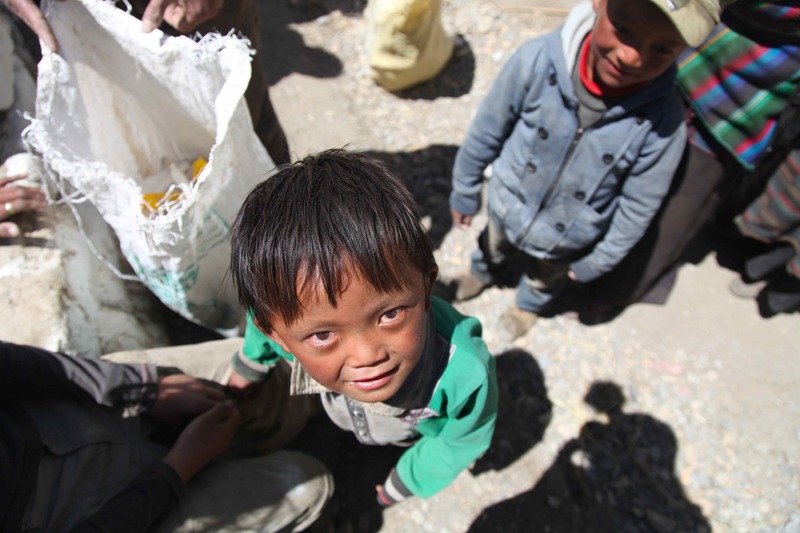 As we walk away from villages here in Nepal, we take what we can from our personal duffel bags and hand them to those who could clearly use a better pair of shoes or a warm jacket. The more contact we have with those who are in need, the more we can help address all of our basic needs and ultimately share resources, re-allocating our excess clothing and food into the hands of the needy — rather than throwing it away. Even the pencils our children’s school was throwing away made it into the hands of school children today who will use them until the pencils are mere stubs. 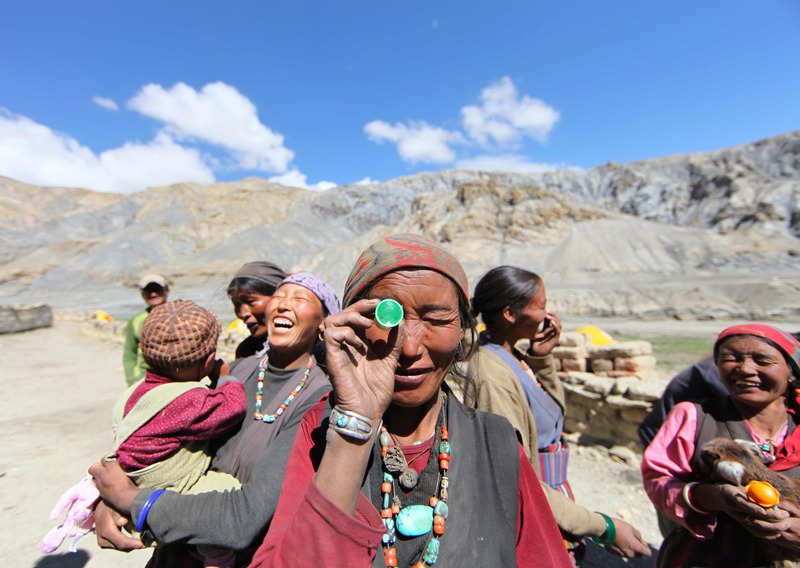 If this is all that we do: turn people’s thrown away items into gifts for the poor, we will have done a small bit of good for children and families that have so very little here in the high Himalaya. Are you looking for a way to donate your clothing so you know it gets to those in need? You could give it away in your local Buy Nothing group. 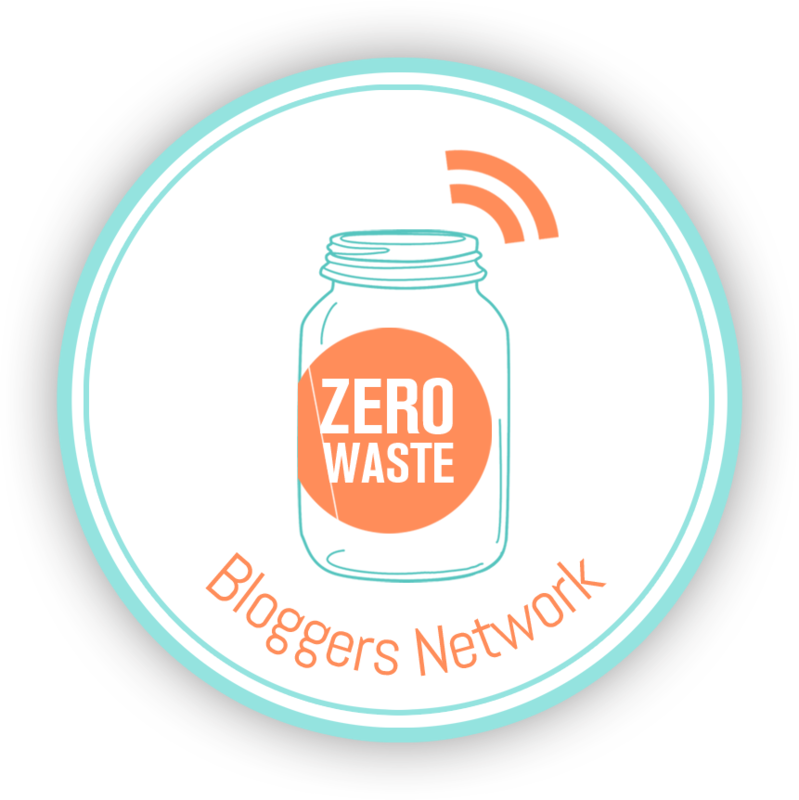 Chances are, if you’re observing in your group, when you post your clothes, you’ll find plenty of families that could use a boost of free clothing, rather than having to buy it all new. These are your neighbors and it’s so easy to do person-to-person giving right in your own ‘hood. 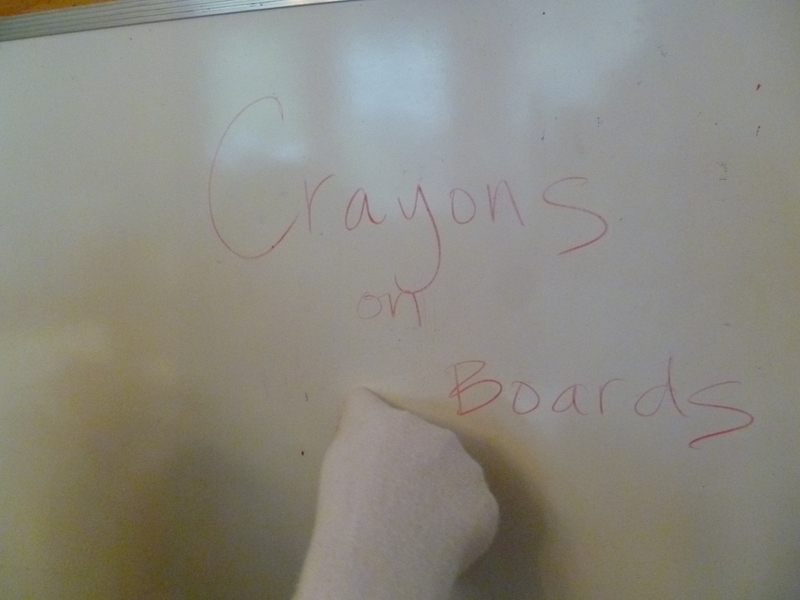 We ran out of dry erase markers and made a discovery. You don’t need to buy more of those plastic markers! 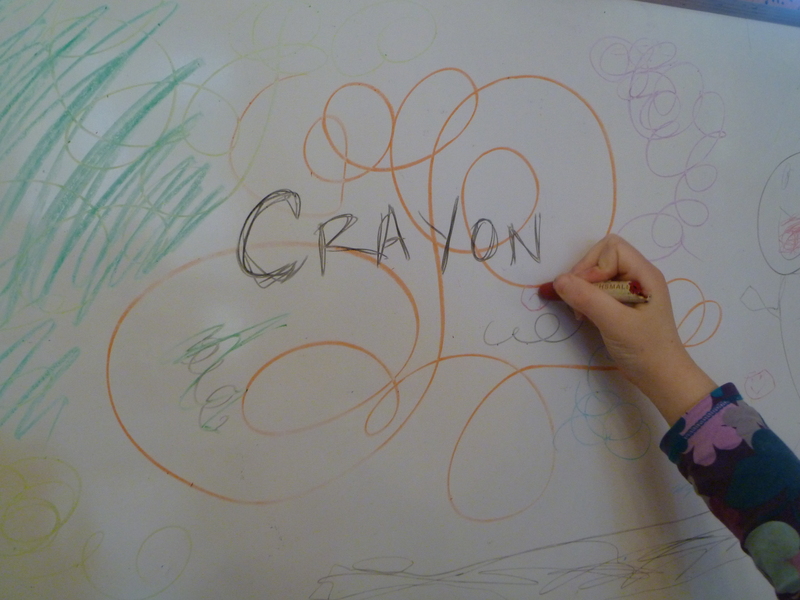 Large crayons work just fine on dry erase boards. Simply use a soft cloth to wipe it off, with a little extra elbow grease. 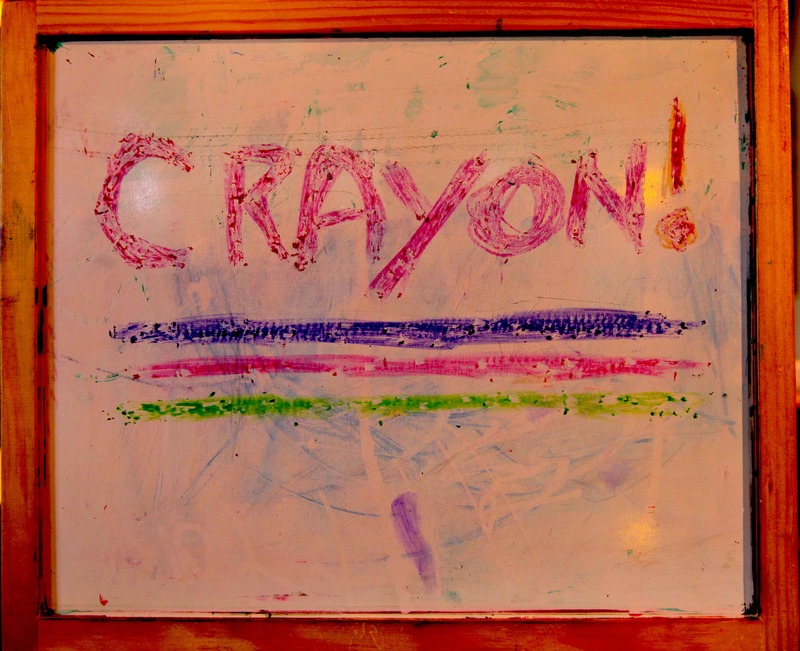 Crayon going onto a whiteboard…..And crayon coming off the same whiteboard with an old sock eraser. This really does work, and it does wipe clean! Just sayin’. Potato chip bags are something we’ve all handled and then thrown into the trash. If your conscience has you wondering if there are alternatives to sending that bag into the landfill, you’ve come to the right place. If you simply want to try to reduce your chip bag footprint, just make your own easy microwave chips using Rock Farmer’s simple method. If you want an oil-free recipe with a few more steps, give this one from the Kitchn a try. 1) If you’re not able to resist purchasing snacks in crinkly bags, then use your bags as gift bags! 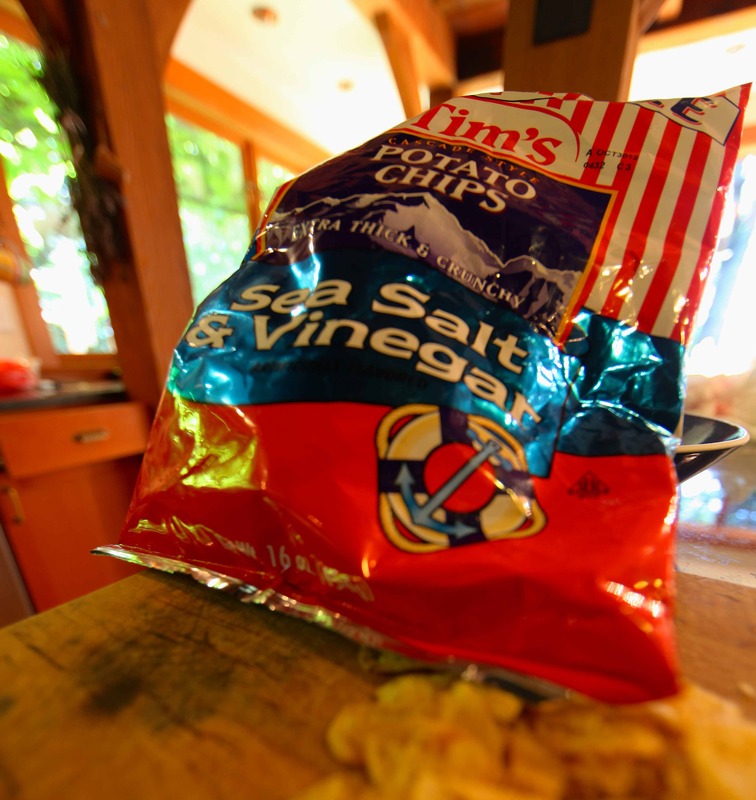 It’s easy to do: Turn your chip bag inside out, wash it with dish soap to get rid of any grease. Dry it out. 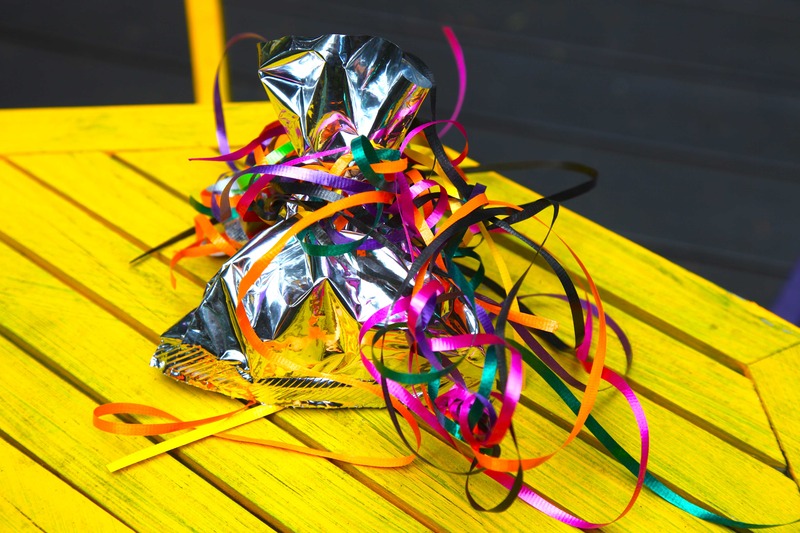 Then reuse the silvery or white side as a mylar-style gift bag. We do this all the time and reuse them over and over. We just attach some pretty ribbon like these pictured here which we found on the beach (no kidding) hanging beneath a deflated helium balloon all twisted up in seaweed. These ribbons last forever, they’re made of plastic, and look as good as new even after years of floating in the open sea. I’ve picked up so many of them on the beach, I’ve had occasion to give a bag of them away on my local Buy Nothing group, with the caveat that the person agrees to keep the ribbons on indoor gifts and not set them free with a helium balloon. When you’ve seen them wrapped around the necks of baby seals and sea turtles, you can’t help reconsider why we risk sending them into our seas via floating balloons in the first place. But I digress. 2) Make a shoulder bag. Some chip bags have a cool vintage look to them and could make a great shoulder bag. 3) Make a gum wrapper-style chain bracelet. Remember making paper chains from gum-wrappers? If you employ the same method with chip bags and candy wrappers, you can craft some amazing things. First step is making a bracelet. 4) And when you’ve mastered the gum wrapper-style bracelet, you’re ready to move on to the purse. 5) Craftbits has a tutorial for a nice clutch. 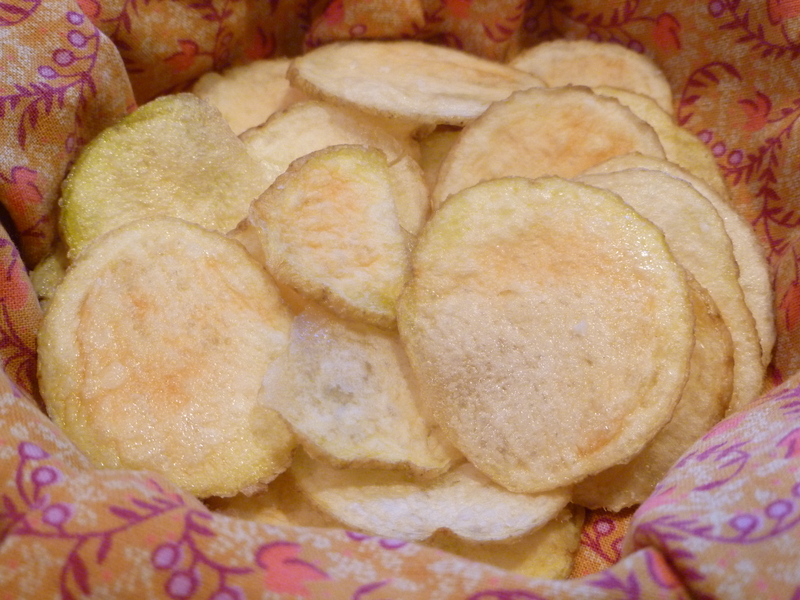 6) Make a potato chip bag mini scrap book. At making-mini-scrapbooks.com, you’ll learn how to make your own cool books that would also make excellent gifts for friends. 7) Instructables has a tutorial for a chip bag wallet. 8) Craft a baby crinkly square to appeal to baby’s need for tactile and aural stimulation. We think a snack bag would make some good crinkly sounds for your little one. Remember the Sunchip compostable bags and how loud they were (95 db)? Maybe stay away from those. They’ve been discontinued, apparently, but consumers certainly had fun with the deafening chip bags. Even a Facebook group was started, called SORRY, BUT I CAN’T HEAR YOU OVER THIS SUNCHIPS BAG. We were excited to see that compostable snack bags were being tested on the market, yet when we did our own compost test of the Sunchip bags in a commercial composter for a month, the bags, surprisingly, were still intact — no decomposition visible. 9) Make an adorable robot from the silvery side of your bag. 10) Yet another Instructable. This time it’s a pencil case. Who needs Terracycle when you can upcycle your own stuff? 11) Cover over an old bracelet with delightful snack bag colors to make a new one! I figure that’s enough to keep you busy with your snack bags, but let’s face it, all of this will end up being tossed in the landfill eventually. Although my kids love to occasionally have a junk food fix of chips, we’re continuing to do our best to stop buying foods that come in unrecyclable bags. Until chips can be sold in something a little more sustainable, we’ll do our best to just say no, or make our own. 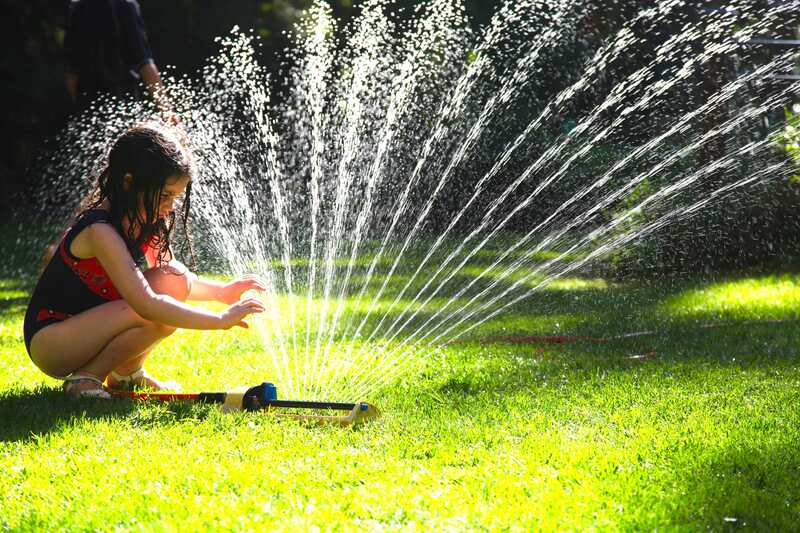 One of the cheapest, happiest forms of warm weather play for children is a garden hose with a sprinkler hooked up to it. 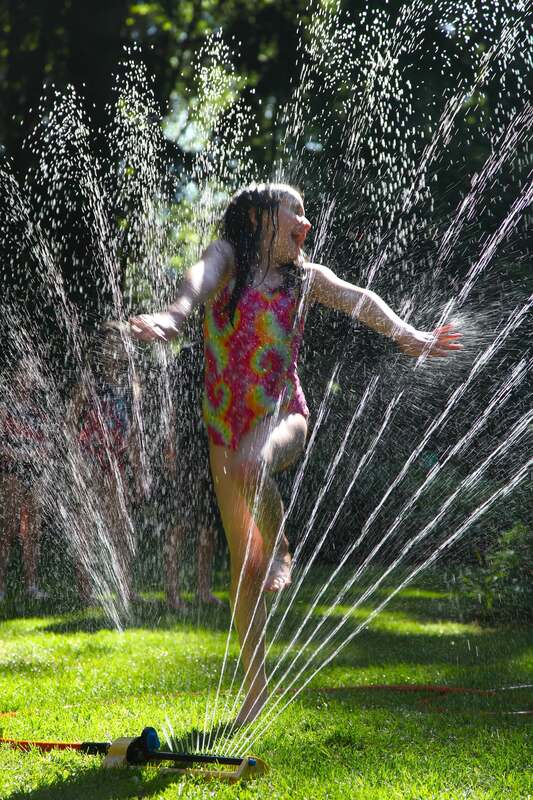 For our children, it means hours of joyous play. The challenge for us is the knowledge that most hoses are made of toxic chemicals and hence are full of pthalates and Bisphenol A. Both are known endocrine disruptors and if children drink from a hose their BPA levels will rise significantly. 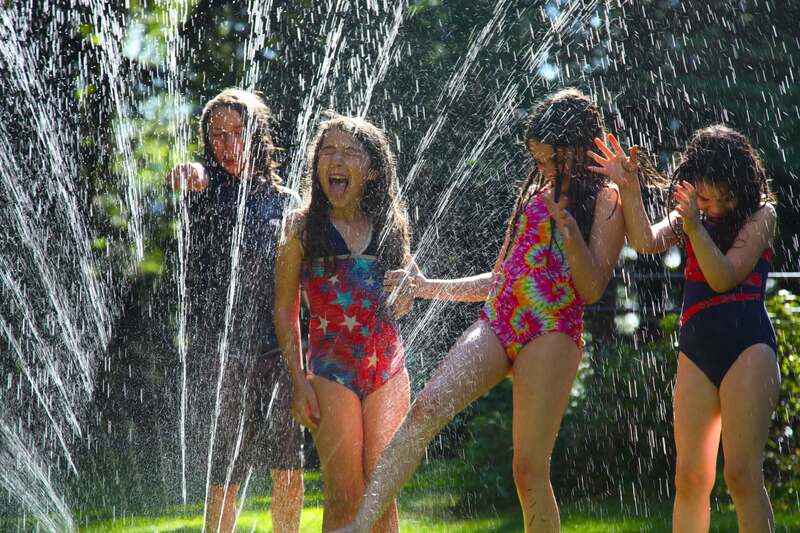 Lead has also been detected in most garden hoses. It’s unknown what the effects are to the soil and plants, but what’s clear is that the next time we buy a hose we should be aware of studies on the chemicals hoses can leach and which hoses are safest. Here’s a 2016 study on the toxicity of hoses done by the Ecology Center. 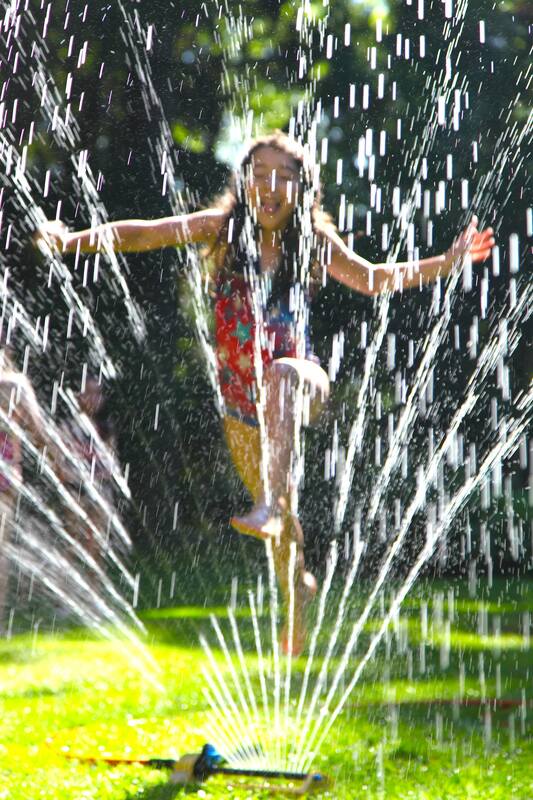 We do have one PVC-free hose and that’s the one we use for kid water-play. In fact, we use it as often as possible, as we phase out our other old hoses. An irrigation project we’re longing to do is a hose-free drain system from our pond to the vegetable garden so we can skip the hose quotient altogether. No wonder our waters are full of estrogen-mimicking chemicals that are affecting indicator species like fish. If you’re interested in phasing out your old hoses or reusing one that’s broken, we’ve seen them sliced lengthwise in small sections to be used as blade protectors for hand-saws, or used on the side of a garden shed for wall-art, or woven on an old chair to create some cool outdoor furniture. But, for the purposes of watering our garden or for kid-play, from now on we’ll be seeking out BPA and lead-free hoses.